Class Description: Students will learn the LTCO (long-tail cast-on), the knit stitch using the Continental method. 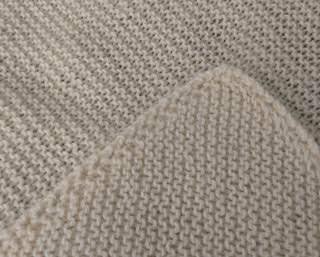 We will also go over types of knitted fabrics and basic terminology and abbreviations used in knitting. PLEASE NOTE: CLASS MUST HAVE A MINIMUM OF 2 STUDENTS; IF CLASS MINIMUM IS NOT MET, REGISTRATION FEE WILL BE REFUNDED, and student has the option of scheduling a 1-hr. private lesson ($30/hr) by appointment instead. Cost: $30 (includes $5 registration fee; balance of $25 to be paid to instructor at time of class). Experience: None needed - this class is for beginners. If you are a crocheter, and have wanted to learn to knit, this is the class for you, since the yarn is held and tensioned in the same hand. Class type: lecture, demonstration and hands-on instruction. There is no specific project associated with this class, but students will be advised on how to create a scarf if they wish. Materials/tools: PLEASE BE SURE TO HAVE ALL MATERIALS AND SUPPLIES PRIOR TO THE CLASS; CLASS WILL BEGIN PROMPTLY AT STATED TIME! Worsted, aran or chunky weight, acrylic or similar blend yarn, in a solid, middle-value color. To sign up for this class, please register through the website, or call the shop to be added to the list - registration fee goes to the shop, and the class fee is paid directly to the instructor via check or cash at the time of the class. If you are unable to attend, please call the shop no later than 48 hours prior; otherwise, registration fee is non-refundable and non-transferable. This class has a 2-student minimum; if minimum is not met 48 hours prior to class, registration fee will be refunded, and student has the option to register for class at a later date, or contact the instructor for a 1-hour private lesson ($30/hr) by appointment.